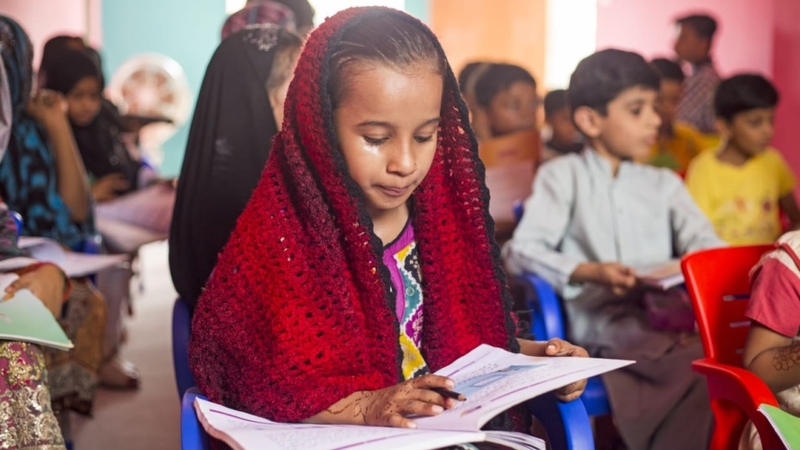 Karachi, Pakistan – In the heart of Karachi’s southern neighbourhood of Lyari, a cafe has given birth to, and shelters, dreams of many women of the area. 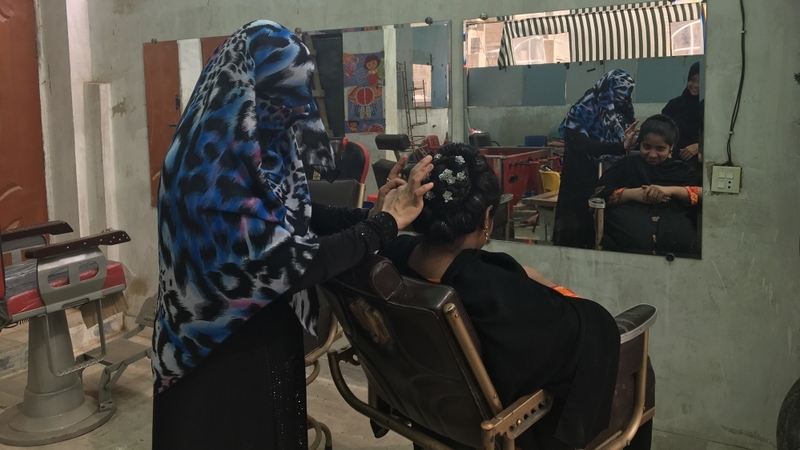 At the Lyari Girls Cafe in Pakistan’s southern city, there is a 50-year-old who wants to launch her salon, a 19-year-old who is secretly filling out university application forms and the girls who cycle on the streets. Set up in 2017, the cafe is located on the roof of a block of residential flats on a street called Phool Patti (petal) Lane. But there are no flowers here. Informal “dentists” and kiosks line the street which is hardly 10 feet wide. Goats have the run of the place and rats scurrying past is normal. Men sit by the side watching the world go by, while the women, in their black robes, look down as they walk past. Gunshots mark the facade of all architecture. The bullet-pocked walls of the buildings are a reminder of Lyari’s past. The area suffered at least two decades of conflict and almost became an adjective to describe Karachi’s violence. Parts of the neighbourhood became “no-go” areas because of the gang violence until a paramilitary operation in September 2013 aimed at improving the situation. Those were bloody years for Lyari, and Phool Patti Lane was among the worst affected. At the end of the street, there once was the infamous “White House”, the torture cell operated by one of the most notorious gangsters in the area, Baba Ladla. All that remains are the broken walls, a rubbish dump, and many stories of how things were then. Zulekha Dawood, 26, vividly remembers what it was like living here five years ago. When the family and their neighbours were able to return two and a half months later, everything in their house was exactly how it was. But there was a stillness in the air. “You could only hear the sound of the birds, it was all so quiet. There was so much fear, the fear that had been embedded in all of us,” Dawood recalled. While men had access to public places, street corners, community centres, tea stalls, where they could interact in search of normalcy, the women had nowhere to go. at Sea view, Karachi #IDG2018 to highlight the challenges girls face while advocating for their empowerment. “We felt like we needed to help these women who were living with trauma and had no space to assuage their fears,” Dawood explains. 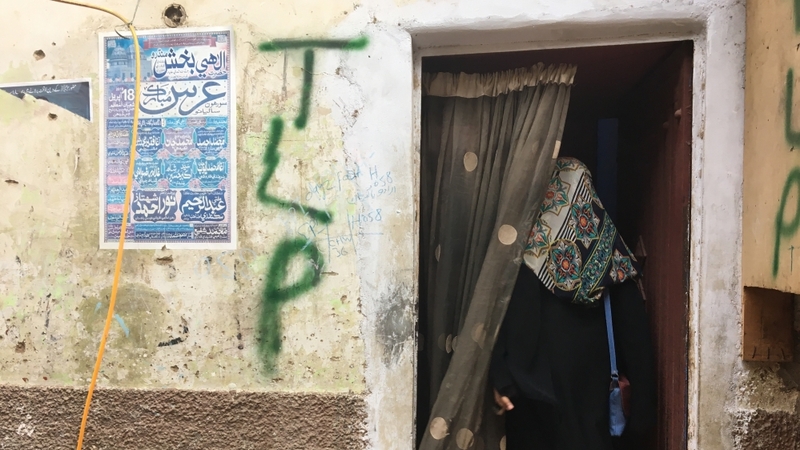 Lyari, much like the rest of Pakistan, has barely any recreational spaces for women who, in comparison to men, are largely invisible in the public sphere. A World Economic Forum report on gender equality released in 2017 ranked Pakistan the second worst country in the world to be a woman. After setting up the cafe, Dawood and her friend Raheen Rimsha, 19, working with Lyari-based NGO Arado, which focuses on gender equality, went door-to-door inviting women to visit. Initially, there was resistance from residents who did not understand the need for or concept of the cafe. But soon, that changed. Now, with the venue working more as a community space than a cafe, women of all ages spend hours learning new skills, playing foosball or carrom and practising different hairstyling techniques. On the roof, there is a green canopy, some handmade decorations and some Christmas decorations on the wall. For 19-year-old Summaiya Muhammad, the cafe is an escape from her family, who believe a woman’s place is inside the house. “My father always says what is the point of me studying as eventually, I will be spending my day standing by a stove [in the kitchen],” said Muhammad, who has been visiting the cafe for seven months now. The cafe offers English language classes. Makeup and hairstyling lessons are delivered in Kachchi, the language spoken by many in the area. There are computer classes in Urdu and guest lectures on topics ranging from mental health to photojournalism and cybercrime laws. “The cafe is a safe space for women and girls to socialise, connect with other women and get a break from the stresses of everyday life,” said Nida Kirmani, a sociologist who has done extensive research on Lyari. As closing time nears, girls – who hail from different parts of the city – start gathering and head over to a nearby school’s premises for football, boxing and cycling. To see women cycling in any part of the country is very rare and Rimsha recalls being jeered at by young boys when the group went out for the first time. “They said their sisters were at home and we should be too,” said Rimsha. 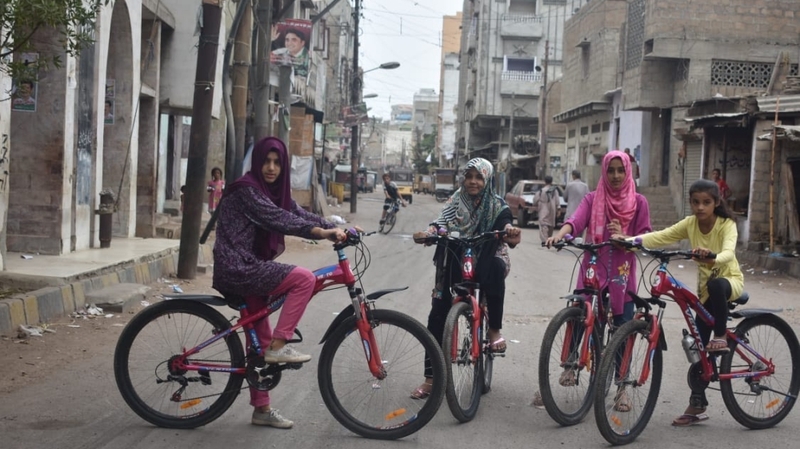 The girls can be seen cycling around the city early every Sunday morning: At 6:30am, most of Karachi is sleeping and they can freely ride on the streets. But as the cafe and its activities gathered momentum, so did the opposition. Arado President Sultan Mandhro is concerned about the cafe’s future due to the neighbourhood presence of the Tehreek-e-Labbaik Pakistan (TLP), a right-wing political party which won parliamentary seats in the 2018 elections. TLP organised violent protests across Pakistan following the acquittal of a Christian woman, Aasia Bibi, in a high-profile blasphemy case earlier this year. On the front wall of the white building where the cafe is located, ‘TLP’ is spray-painted in green. Unconcerned by the cafe’s other activities, TLP parliamentarian Younus Soomro told Al Jazeera he was not a fan of the cycling initiative. “I personally don’t look at activities like cycling as very decent for women. We are a Muslim country, the Islamic Republic of Pakistan, and this would not even be acceptable according to the Shariah,” said Soomro. TLP’s presence in Lyari has been a concern for some as this is the first time a religious party has won seats from this constituency. There have been no direct threats to either Mandhro or the girls, but there are some implicit threats. “We sometimes see comments on social media that are clearly meant to intimidate us and stop us from our sports activities,” said Mandhro. But, despite the complexities and the dangers, the girls are just happy they have a chance to get out of the house and undertake these activities. Naila Niaz, 19, comes to the cafe for boxing training. The newfound freedom for her is “addictive”.